Found hunting on a stucco wall, urban Phoenix, Maricopa Co., Arizona. March 2017. 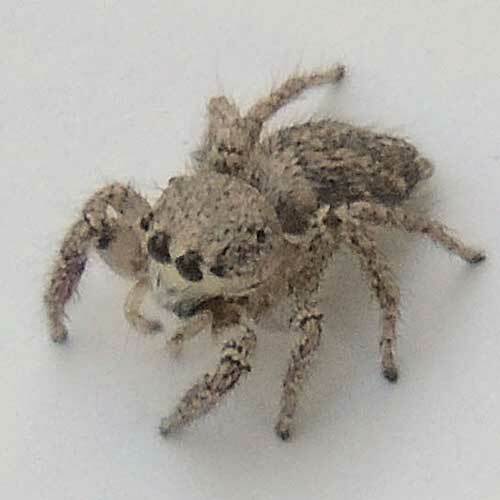 There are some 100 species of Habronattus in North America. They are active spiders that hunt by day using their keen eyesight and without the aid of a sticky snare. There are eight eyes in total; two very large and two large eyes face forward and appear black in this photo. Habronattus males are intricately and often colorfully marked especially in the face area. Females, such as this one, on the other hand tend to be gray or brown and thus cryptically marked. Salticids jump on their prey insects from several centimeters away.